MAD Love for MOD Pizza! We have some MAD love for MOD Pizza! Come out and enjoy some pizza (or a salad or those delicious no name cakes) at MOD pizza on Thursday, March 7 from 10AM to 10PM. Mention SO Derby or Southern Oregon Derby at the register and a portion of the proceeds of your meal will be donated. This season our travel team is participating in numerous tournaments including the WFTDA (Women's Flat Track Derby Association) recognized tournament: the Big Island Brawl, located in Hilo, Hawaii. We need YOUR help in getting us there so we can compete! Our goal is to raise at least $10,000 so we can cover most, if not all, travel costs for our players who need financial assistance. 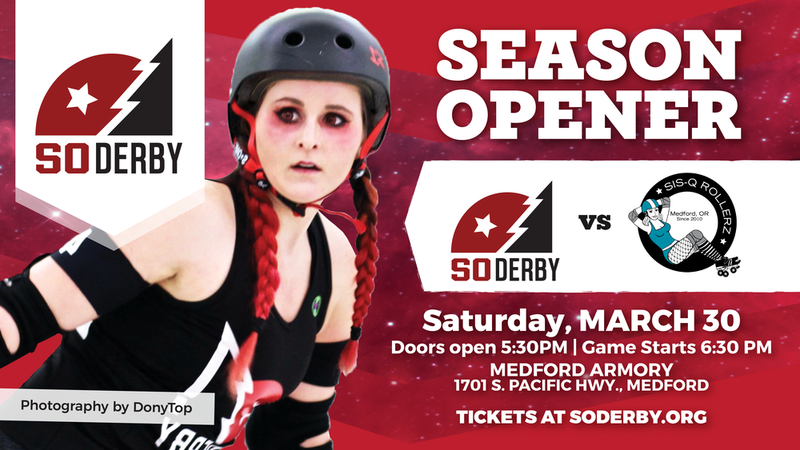 Join Southern Oregon Derby in celebrating our 10 year anniversary through a full evening of derby hits and take-outs on Saturday, March 30 at the Medford Armory (1701 S Pacific Hwy, Medford, Oregon) for our season opener. To kick-off this momentous occasion, for the first time in Rogue Valley’s history of derby, SO Derby will be playing against SIS-Q Rollerz! For this game, SO Derby will be sending volunteers in the crowd to gather funds which will be going towards our service partner, Special Olympics Jackson County! Special Olympics Jackson County has been our service partner for 8 years and this organization is very dear to our big red hearts. Special Olympics Jackson County is a not-for-profit 501(c)(3) charitable organization incorporated in the state of Oregon to provide sports training and athletic competition for persons with mental disabilities. Help us help our fellow athletes train and compete! Every contribution makes an impact whether you donate $5 or $100. SO Derby is partnering with local business, Beerworks, to provide our fans with refreshing beverages during the game. SO Derby will be having a silent auction, bake sale, pizza, popcorn and team merch available. look out for updates! SO Derby will be adding more away games and community events to our season. 2018 was a great year for SO Derby and we look forward to our 2019 Season! On November 10th, SO Derby hosted a double header: Fall Brawl. The first game was a mixed-scrimmage of skaters from around southern and central Oregon. Both teams fought hard, but in the end, the score was Team White: 245 to Team Black: 118. The second game was an in-house scrimmage and the debut game for SO Derby’s new in-house teams, The Rogue Ravens and The Crater Lake Krakens. Though these skaters practice together, game play against each other was a new challenge. The final score? Ravens: 190 to Krakens: 124. Fall Brawl 2018’s service partner was Habitat for Humanity. The combination of our bake sale and online fundraising efforts were able to raise $1,000 for Habitat for Humanity. We would like to thank our 2018 Board of Directors and Training Committee leaders for their service and leadership. As a non-profit organization, we run solely off the generosity of our skaters and volunteers donating their time to our league. We would not be able to run efficiently as a organization without their dedication. As we move forward to our 10 year anniversary, we welcome and congratulate our 2019 Board of Directors and Training Committee leaders! Naughty Maudie, a long time powerhouse of SO Derby, is retiring from competitive skating. She has been a huge asset to our league since 2009. Not only did she hold numerous leadership positions through the years, including President, Vice President, and Secretary, Naughty also helped SO Derby become a WFTDA membership league. She was Assistant Coach for 2016 and Head Coach for 2017 and 2018, which she says are her favorite years. When asked, Naughty said her proudest moment was leading the training committee and team to their first wins after a three year losing streak, then continuing to keep that momentum going! Fortunately for the league, Naughty is not leaving us completely. Her next adventure in the derby-verse is becoming a WFTDA certified referee and continuing to hold her position as SO Derby’s WFTDA Officials Rep. We want to extend our gratitude and continuous thanks to Naughty Maudie for her endless commitment to the league, its teams, and the players. After almost 10 years of service to the league, our long time Treasurer and front of house volunteer, Derby Mom, is retiring from SO Derby. With her work as front of house volunteer organizer, as well as armory liaison, our league wouldn’t be where we are today without her work as a non-skating member of SO Derby. We’d like to extend our thanks to Derby Mom for her dedication and diligence to SO Derby and its skaters over the years. Due to this new change, the Board of Directors has appointed Madame Morticia as our interim Treasurer for 2019. The B.o.D is confident that Morticia will do a wonderful job working with the other board members, as well as the skaters of SO Derby. This Summer, SO Derby will be battling it out at the Big Island Brawl tournament located in Hawaii! The four day tournament will be happening June 20 to 23, 2019 and will be a WFTDA recognized tournament. What this means is that we will be playing for ranking within the Women’s Flat Track Derby Association! We need YOUR help in getting us there! Our goal is to raise at least $10,000 so we can cover most, if not all, travel costs for our players who need financial assistance. Every contribution makes an impact whether you donate $5 or $100. SO Derby is a 501(c)(3) volunteer run organization. When you contribute, please make sure to use this code for tax purposes: 80 0575212. Happy Holidays from SO Derby! While practices have continued at the Santos Community Center, cold weather has kept skaters indoors. We look forward to getting back on the Greenway in the spring! Our annual holiday party formerly known as SORGies, now known as SODies, was a huge success! We also celebrated excellence on and off skates with our traditional SO Derby trophies. Special thanks go to Madame Morticia for hosting the SODies and to everyone who brought delicious food and drinks to share. Don’t forget to save these dates for SO Derby! 2017 is looking good and you won’t want to miss it! It's been a great fall for SO Derby! With the Pride Parade, Harvest Festival, Greenway skating and the Annual Halloween Party we've been busy! Mountain Mel took the top prize on Halloween with her homage to Marge Simpson, Pretty Awkward pulled into second as Little Red Riding Hood and T-Wrecks brought in third as Cruella DeVille. Los Arcos provided food and drinks for an evening of fun. Many thanks to Madame Morticia, Sadie Hell Cat and Cyber Attack for the party preparations. Indoor practices have resumed for our skaters at the Santos Community Center in October. We are so lucky to have a variety of places to skate while the Medford Armory finishes up construction. To our summer of outdoor practices at Lewis Park, we bid a fond farewell till 2017. We kicked off November in style! Our training committee and skaters traveled up to WFTDA Champs in Portland for a world class weekend of derby to cheer on the roller derby elite. Every bout a nail biter. Every day something new to learn and critique. We all came away with new derby crushes and energized and inspired to try new things on the track! SO Derby with the famed Hydra! The second week of November, SO Derby had the pleasure of playing our long time friends in Coquille. The Adventure Coast Roller Derby's Star Stompers hosted a great evening of extremely well matched derby. Both teams won the hearts of the crowd but SO Derby took home the win with one extra point. 151 to 152. It could not have been a more sporting evening. Lead changes every jam, smiles and hard hits at every turn. Thank you to the Star Stompers for all the fun! This week we finished up building our 2017 season! With home games at the Medford Armory and away games on the books we are going to have a great year of derby for our fans! Check back next week for more news, we promise it's going to be awesome! Congratulations Naughty Maudie - Rogue Valley Derbygirl of the Year! Rogue Valley Messenger names SO Derby's very own Naughty Maudie 3000 as Rogue Valley's Derby girl of the year! Congratulations!! !